2013 is looking awesome book-wise! There are so many exciting new titles! I decided to host a giveaway to give you guys a chance to win one of them :) 3 lucky winners will get one book from the list below! Good luck! 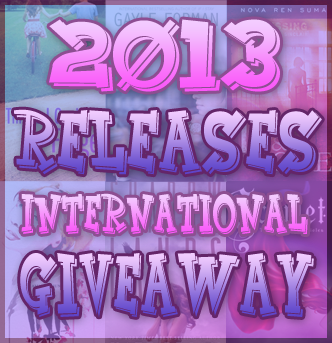 3 winners will win one book from the list! I would totally love The Beautiful and the Cursed or The Goddess Inheritance! I want to choose Things I Can't Forget or Just One Day. They have been in my wishlist since I first found out about them. Btw, you always host awesome giveaways. Thanks so much. Hope I can win one of them. hehe.. I would love to have Scarlet or Dark Triumph, I'm dying to read both of those. I'd choose Between the Devil and the Deep Blue Sea. The cover is gorgeous, and it sounds so eerie! I am stuck between Dare you to & Unravel me. I loved Pushing the Limits and I can't wait to read the next one. And I LOVED, Loved Shatter Me and I can't wait to see what happens next in the series. I would probably pick Emblaze, because I love that series! Premeditated! As soon as I saw that one, I wanted to get my hands on it. :) Thanks for the giveaway! Ah, and why. I like Brenna Yovanoff narrative and and I'm interested in this book for a long time. I would pick mila 2.0~~~ I've read soo many rave reviews about it! Thanks for the awesome giveaway! It's a super tough call because those titles are awesome -- SO MANY that I'm looking forward to and hope to preorder if I get some Christmas money. I'll go with 'Just One Day' because I read the ARC and I really loved it! I'll need a copy to re-read before the sequel, which I am already eagerly anticipating. It's hard to choose, but I'd probably go with The Ward because I've heard quite a bit about it and it sounds like a fantastic story. STAR CURSED because I fell head over heels for the first book! I would love to have Unravel Me. :) Or Paper Valentine, Prophecy. Oh boy, there're lots of books! :) Thank you for the giveaway. I would definitely pick The Archived because the synopsis sounds SO intriguing! oh man.. all the books looked interesting! i would like to win any of the books. haha. It's really hard to choose. I think I'll go with The Ward. I don't know what it's about but I hope it's good because I love the cover. Either The Goddess Inheritance or Shades of Earth I think, because I've been waiting on both of them! Thanks for the giveaway! WoW this is a hard choice. I would love to have Poison because this story sounds really good! And I also would love to have Star Cursed because I read the first book and loved it! and cannot wait to read this second book. I choose Unravel me, because a I absolutly love this serie. No idea, great books to choose from, maybe The Archived by Victoria Schwab. Why? Because I loved The Near Witch & its prequel The Ash-Born Boy - her writing style is lovely & The Archived sounds so awesome! They're all so awesome! I think I'd go with Scarlet, though! I'd definitely choose Dualed or Unremembered. They're both books that I'm so excited for next year! Darkness Fades (Darkness Falls Series, Book 3)by Jessica Sorensen. I would pick Dare You to. I loved the first book and her style of writing. I would choose Poison. I've been very excited about that book. I cannot wait to read it. It sounds absolutely fantastic! 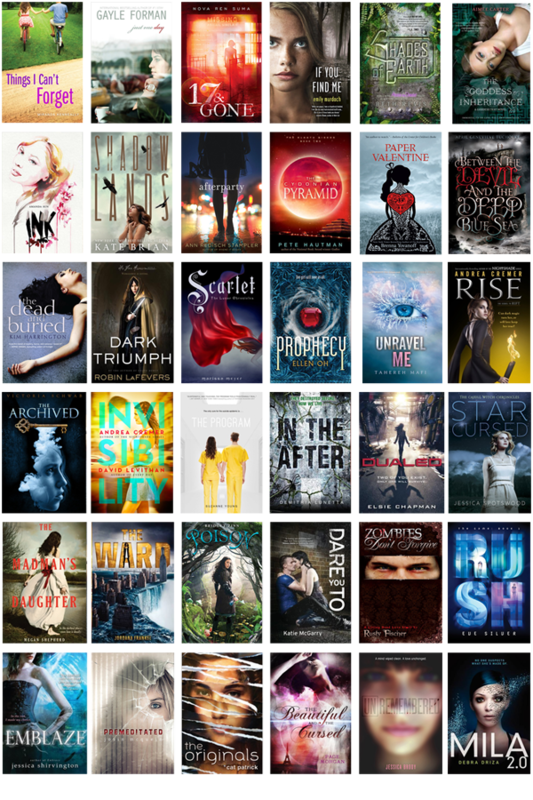 There are SO many great looking books coming in 2013! I think I'd pick Mila 2.0...but it's hard to say, I'd have a VERY hard time narrowing it down! I would pick Dark Triumph because I absolutely loved Grave Mercy. I'm not caught up on some of those that are part of a series. I think I'd pick The Archived cause the author is cool and I follow her blog. I have no idea what i'd choose. There are many books on that list that i'd love to read. Some of them are: Scarlet, The Program and Dualed. Thanks. cydonian pyramid. i couldn't quit looking at the cover as i was checking out or trying to check out the others. thanks for the awesome giveaway and happy holidays to you and yours. Oh man that's a tough choice but i'd have to go with Unravel Me. I would probably choose Dualed.I am a big fan of Dystopian novels. Thanks for a great giveaway! Rise because I adored Rift so much! I'd like to read Things I Can't Forget. Wow, so many amazing books coming out next year! There are so many that are near/on the top of my wish list, but I think I'd choose The Archived because I've been waiting for Victoria to put out something new ever since I finished The Near Witch almost a year ago! Thanks for the great giveaway, Evie! Such AMAZING choices! I would probably choose Dark Triumph, since I loved Grave Mercy so! This is a tough choice! I'd pick Unremembered, Dare You To, Dualed or Afterparty. Unravel Me by Tahereh Mafi because I love the book Shatter Me, such a cliffhanger but I think its worth waiting :) Thank you for this giveaway. I'm thinking Dark Triumph or The Program as I've pre-ordered most of the others already, they're pretty much ALL on my wishlist! I would pick Scarlet because I absolutely loved Cinder. Thanks for the giveaway! I'd probably choose Unravel Me by Taherah Mafi... I'm really looking forward to seeing what happens next in the series! Things I cant forget :), because i have some baggage from the past and i am curious what the books refers to. Thanks Evie! :) I think I'd pick Just One Day - it sounds really good! Scarlet, because I really liked Cinder! Dare You To because I loved Pushing the Limits!!! Thanks so much for this giveaway! I'd choose Scarlet or Unravel Me if I won because those are two sequels I'm anticipating greatly and I'm dying to know what happens next. I'd choose Dare You To because I absolutely loved Pushing the Limits! Def Scarlet bc I loved Cinder & can't wait to read this one! I would pick Dare You To because I loved Pushing the Limits and the cover is amazing! I'd probably pick Unravel Me by Tahereh Mafi, because I loved Shatter Me! So many books - maybe The Ward or Dualed or Dark Triumph! Dark Triumph because I loved Grave Mercy! I would choose Dare You To because I loved Pushing the Limits. Thanks Evie! You're a sweetheart!! I would probably choose Dark Triumph, because I adored Grave Mercy and am DYING for the sequel. It's one that will have a happy dance when it comes in the mail! Dark Triumph, I really want to read it ASAP!! The Madman's Daughter - because OMG it sounds amazing as anything, and because who doesn't want that gorgeous cover on her shelf?! I'd pick Unravel Me, as I absolutely loved Shatter Me! How to choose just one book.. They all sound amazing and most of them are definitely on my TBR list. Probably, I would choose Unravel Me because I loved, loved. loved Shatter Me. :) However, Dualed and Mila 2.0 sound very intriguing. I think I would choose THE MADMAN'S DAUGHTER. It looks amazing. I think I would choose The Ward but The Archived is real close. Scarlet! I absolutely LOVED Cinder, and can't wait to read Scarlet! Oh dear, there's so many amazing titles listed! How the heck to pick just one? I guess, I'd pick Scarlet because I have a paperback of Cinder sitting on my bookshelf right now awaiting to be read. I'm hoping to get to it soon. Thank you for the chance to win! Geez, there are so many great books. I'm torn between The Goddess Inheritance (because I love that series so much. Henry rocks), Unravel Me (because I love that series so much) and Rise (because I've read Nightshade and I really liked it. I have all the other books in the series, I just haven't read them yet). Thanks for the giveaway! This is awesome! I want ARCHIVED as my trophy for this giveaway! I would either pick Unremembered, Premeditated, The Program or Dare to You. I'm a big fan of Jessica Brody and Suzanne Young. WOW AMAZING GIVEAWAY!!! I love your blog and this is the first time I've been here, but I'm glad I found it! Awesome Giveaway! Thanks so much for it! Shades of Earth!! The cover is beautiful and the story is like- WOW! Thank you for the giveaway, I´d choose Unravel Me, I really liked Shatter Me. I'd choose the new Gayle Forman book. I loved If I Stay and Where She Went and I'm sure Just One Day will be a similar unforgettable read. I would love to read The Ward and The Program. I'm in love with their synopsis and the covers are amazing. Thanks for the giveaway and for making it international :). I would pick RISE because I looove Andrea Cremer! Probably Afterparty because I'm in love with the cover! I would pick Scarlet because I love, love LOVED Cinder and can't wait to see what happens next! I would choose Things I Can't Forget. I have read the other books in the series and I loved them! Miranda Kenneally is a great author! my selection is Paper Valentine, as the cover appeals to me!! Shades Of Earth. I loved Across the Universe and now I need to read the last two books in the series. I'd pick Between the Devil and the Deep Blue Sea because it sounds amazing! There are so many that I want, but the one that I want the most is Scarley by Marissa Meyer. I'm torn between Unravel Me & Dare you to ... because I Love both series! I'd probably choose The Archived beacause I read your review and I'm looking forward to read this amazing book! I'd pick The Ward because I have heard great things about it! They all look so good that it would be really hard to choose. But I'd go with Shades of Earth. OMG! I can only choose one! AH! I'd probably pick Dare You To..Even though I want a bunch more on the list! Dualed is a top pick for me! I can't wait to read this book! I like action in my books and this one sounds awesome! Thanks for the chance! Gahhh so hard! I want so many of these! I would probably pick either Shades of Earth or Rise, because I really loved the previous books in the series. I want so many of these ! 17 & Gone! Or Paper Valentine or Ink. I really only have an answer for the first, so. Because it's Nova!! I'd like to win "Paper Valentine". The cover said it all. It would be between Mila 2.0 and The Program. Just the covers and the storyline themselves says it all. They look and sound like epic reads! I would pick "In The After", it sounds very interesting and the cover got my attention! Why? BECAUSE I LOVE THOSE SERIES!!!! Wow- thankyou so much for this amazing giveaway. I want most of these! But I think I would choose Unravel Me, because I loved Shatter Me, and cannot wait to get hold of the sequel. I'd definitely pick Just One Day by Gayle Foreman because I loved her If I stay novels! Thanks for the awesome giveaway I would choose The Dead and Buried because Kim Harrington is one of my favourite authors. I have no flippin idea. None whatsoever. I can answer why though. Because I want so many of them. Thanks for the amazing giveaway! I would choose The Originals or Paper Valentine. Invisibility... 2 amazing authors in 1! I'd probably pick Shades of Earth by Beth Revis, and Unravel Me by Tahereh Mafi! Ahh so many amazing books being released next year! I'd go for The Ward. I love that cover! I would choose invisibilty, because i've heard its really good book and i like the cover. The ward, Mila, In the After or Between the Devil!! Haha! Thanks Evie! You rock! I would pick Unravel Me! Love that series and am dying to read the next book:) Thanks for the chance to win! I would pick Thing I Can't Forget. I really enjoyed Kenneally's writing style in Catching Jordan and Stealing Parker and I'm really excited for this one!! I would love to read Just One Day. Ouh because of I want to try a new genre of book. I would pick Paper Valentine, I've been waiting for it since I first saw it. Or maybe The Archived or Shadow Lands. Thanks for the giveaway! I think it would be poison. Because it sounds like a really good book. I would pick Shadowlands because I read a really great review for it on Goodreads! It sounds like it is veery suspenseful. I'd love to have Just One Day or Dare You Too! Unravel Me. Because that eye has been looking at me for a long time. I would pick Unravel me or Unremembered.Anyway, all of them are great! i would choose unravel me because i LOOOVED shatter me so much! Either Unravel Me because after reading Destroy Me I want to know more and this story has me hooked. Or Scarlet because Cinder was a great fast paced read which left me with some questions that I need answered!! Dare You To, because I'm curious and can't wait! Dark Triumph by Robin LaFevers. I LOVED the first book and can't wait for the sequel. the archived :) it sounds so intriguing! UNRAVEL ME!! I want more Adam! More! Moreeee! I would pick unravel me!! I loved the first two books in this series. I can not wait to read this one. All these books I want. I think you picked every book on my wish list. Thank you for such a awesome giveaway! I would like to win Poison. The cover is fantastic and I'm dying to read it. Dare to you! by Katie McGarry. I really loved pushing the limits and I liked Beth, and i wanna know her pov! thx for this great giveaway! they all look good! i would choose either between the devil and the deep blue sea or shades of earth. mainly because they look very cool! thanks for this giveaway! I would choose Poison, because the cover just looks very interesting. I would, without a doubt, pick Scarlet. That is one of the books I am most waiting for! I adored Cinder and I can't wait to read more of this fabulous series! Thank you so much for giving me a chance to win this book! I would definitely pick either Ink or Invisibility. These are two that I'm definitely looking forward to reading. It would've been Shades of Earth but I defy getting it at the moment because of the cover change. Thanks for the give-away. I'd pick Just One Day by Gayle Forman! I just finished grad school and I'm finally back to having free time to read what I want! This book sounds like my type of read and the start to a great duet of novels about self-discovery and true love! I pick Prophecy by Ellen Oh - one of the few Asian-inspired YA I've seen.